The Why Files | 1. Snowflakes or snowfakes? The Why Files talked about the nitty-gritty of snowflakes with David Griffeath, professor of mathematics at University of Wisconsin-Madison, who worked on snowflake simulation with Janko Gravner, a mathematician at the University of California at Davis. 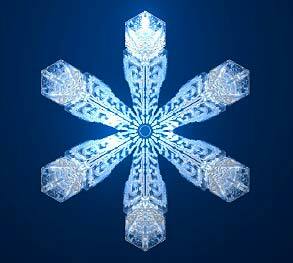 Q: How does your software form a snowflake? A: The model describes three kinds of masses: the water vapor, the ice crystal, and a mysterious boundary layer around the crystal, a semi-liquid layer that is a mixture of ice and water vapor. This semi-liquid layer is thought to be the reason that ice skates work, and it must be important to snowflakes as well; our model did not work until we incorporated it. The main problem that we cracked is actually getting an algorithm that is feasible at current levels of computer performance. We divided the problem into chunks 1 micron [millionth of a meter] on a side. Snowflakes actually form one molecule at a time, but the law of averages kicks in, so we can get away with this simplification. As it is, our model takes 6 to 24 hours on a standard office computer to make one snowflake -- which we call a "snowfake." For each step, at each location, the program must answer repeatedly physical questions: "If you are away from the crystal, do the diffusion step. If you are on the boundary of the crystal, decide whether you want to freeze. If you are on the edge of crystal, decide whether you want to melt...."
A: Snowflakes are crystals that grow by accretion of water vapor from the air, and the details depend on how the crystal boundary interacts with the cloud of water vapor. There is a feedback effect that promotes branching and the formation of dendrites [arms]: If some part of the surface is more exposed to the cloud, that accentuates its ability to attract more stuff, so as it becomes further out, it gets easier for the diffusing particles to find this part of the surface. That's positive feedback. But there is a countervailing effect: It's easier for a water molecule to stick to the concavity on a rough surface than to a flat surface or a protuberance. This opposite effect has to do with attachment kinetics, some ill-understood properties of water having to do with slipperiness that make it easier to fill in the voids. These two processes help create a mixture of polyhedral [chunky crystals] and branching [fernlike] structures. Q: How do you know you are accurately simulating snowflakes? A: We compared our output to a collection of 8,000 photos from our collaborator Ken Libbrecht of Caltech, which show a remarkable amount of detail. According to one popular classification, there are about 80 categories of snowflakes, and the latest 3-D version of our software gets all of them. One thing that made Ken take us seriously was when we made all of these crystals that are about 100 times as wide as they are thick (these are the bogus paper "snowflakes" you see pasted on windows, but few graphic designers know how to design flakes). Our flakes invariably have these little ridges going down the middle of the arms, and so do the real flakes. But we still cannot reverse engineer a snowflake. Although we can demonstrate all the major types, we don't yet know the correspondence between weather conditions like temperature, pressure and humidity on the one hand, and the parameters of our model on the other. Q: How can the arms look so similar without being identical to each other? A: When you look at some flakes, you get a sense that the same sequence occurs on all the arms, but if you look closer, you see little teeny branches mixed up with bigger branches, and the structure may strike you as unpredictable or random. It's bewildering, but there are completely deterministic systems that still appear to be random. We call this "pseudorandom." If you think of the random number generator in a computer, it does a pretty good job of emulating coin tosses, but if you run it twice using the same starting number, every single output will be identical. It is deterministic, but it will still have the appearance of being determined by coin-flipping, of being truly random. Notice the irregularities in this flake? Those result from the random portion of snowflake formation. Courtesy David Griffeath, University of Wisconsin-Madison. The growth of dendrites is based on physical conditions, and conditions are almost the same at each arm, but there is still a random element to the attachment -- under any given condition, a water-vapor molecule has the greatest chance of attaching here, but a few will attach over there instead, and that changes how the next molecule is attached. So even under identical conditions, the outcome can be different; the molecules express themselves in unexpected ways. This combination of randomness and determinism is our answer to the riddle of snowflake formation. Q: We have to ask: Are all snowflakes different? A: (Audible groan) It's the stupidest question, it's completely ill-defined. 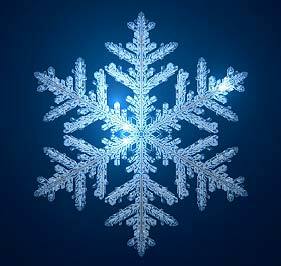 If you want to talk about a snowflake just after formation, when it has 12 molecules, the answer is clearly no, but if it has 1020 (100,000,000,000,000,000,000) molecules, the answer is clearly yes. The chance of replicating that shape, molecule by molecule, is smaller than one over the number of molecules in the universe. But if that's not what the question means, what does it mean? 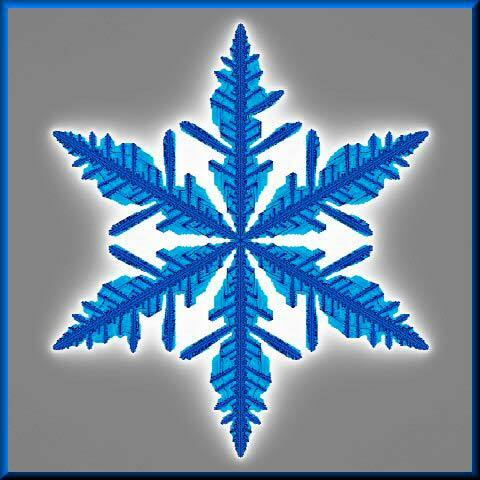 Q: What's the point of making a snowflake generator? A: There is the intellectual challenge, following in the footsteps of Johannes Kepler and others who have wondered about snowflakes, but there are plenty of applications. Crystal growth is a multi-billion dollar industry, and it shows the same sort of dynamics as snow crystal growth. Many metal alloys have a similar structure at the surface, and we are convinced that the same methods used to simulate ice crystals can be applied to them. Another application is self-assembly in nanotechnology, trying to figure out chemical or biological processes that will makes tiny structures with less effort. But I like to study snowflakes as wonders of nature. If you can't see it, is it invisible?